Tom Flanagan was desperately unlucky to deflect a cross into his own net before Jack Baldwin equalised from another fantastic Grant Leadbitter corner. 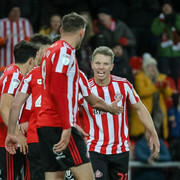 Despite some significant second half pressure Sunderland could not find the winner to take full advantage of one of our games in hand. That said, the point still puts us into second place. Barnsley and Portsmouth are alot closer than we'd like. Time as ever to rate the players. To do so, all you need to do is scroll down and select a rating between 1-10 for each player. Once selected, a comments box will appear and you can leave your thoughts on how that player performed. If you're here just to see what everyone else thinks, you can click 'Submit ratings' without selecting anything to see what the scores on the doors are at that point. We'll have a round up article tomorrow.